Even though Chislehurst caves are refered to as "caves" they are actually completely man made. 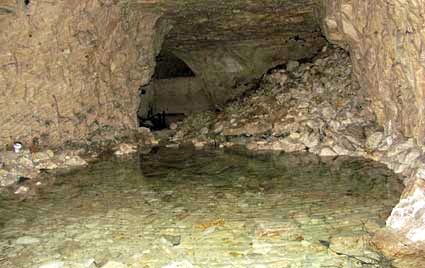 Its thought they started out as flint and chalk mines, though they were possibly looking for something else when they started due to their age. The first mention of the caves goes as far back as 1250, but little is known of its purpose at that time, since most of the excavating was done in the last 2 centuries. The 22 miles of connected tunnel havnt been in use since the 1830's for the purpose of mining, but became a popular tourist attraction in the the early 1900's. At the outbreak of the 1st world war they were used as an ammunition depot for the nearby Royal arsenal at Woolwich. After the war the tunnels were used to grow mushrooms, but this tasty function only lasted until they were again needed for war use, and at the start of the 2nd world war they were turned into a huge air raid shelter. It could hold 15,000 people and was fitted with electricity, a chapel and a hospital. Most of this can still be seen today as the tunnels are currently open as a tourist attraction. If you wish to visit for the purpose of an investigation then please contact the venue directly to arrange such a thing. The caves are widely believed to be very haunted, with some people arguing it as a contender for the most haunted place in London. This is mostly due to the amount of spirits people have claimed to witness here, and that combined with the tales of this place's history and its atmosphere it can certainly create a very chilling feeling. One of the most well known tales of Chislehurst caves was started in 1903 by the Vice President of the British Archaeological association, William Nichols. He suggested that the caves were initially made by the druids, Romans and Saxons for the purposes of spiritual worship, but this is only speculation and there is no evidence of this. On the tours the caves offer the guide often points out what are apparently roman features and druid altars, but there is no way to verify this. However it has made for an excellent addition to the ghost stories of this place. As for the ghosts themselves there are tales of everything from spirit dogs and horses, to the angry ghosts of druids and various soldiers wearing everything from Roman armour to cavalier and world war uniforms. Some people have even made some pretty strong claims, such as being approached by a woman who is soaking wet, and she is believed to have drowned in one of the caves pools, or the ghostly appearence of an old lady pushing a pram through the passageways. Non of these stories can be verified, but due to the caves age and how big they are, at least several dozen people would have died down here in its time, and who knows, maybe some of them are still there.